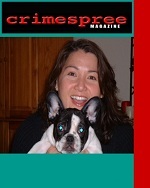 Issues 9 and 10 of Crimespree Magazine (Nov/Dec 2005 and Jan/Feb 2005) are collected in a single eBook. 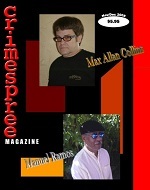 The cover of Issue 9 featured Max Allan Collins interviewed by Sean Chercover and Steven Torres talked with Manual Ramos. Alafair Burke was interviewed by Ruth Jordan for Issue 10. Highlights of Issue 9 include: Lori Lake’s article on the gay detective novel, Don Bruns’ The Challenge, Brian Azzarello is interviewed by Manuel Ramos and Denis Mina is interviewed by Ruth Jordan. Reed Farrel Coleman writes about his Irish Godfather, Shirley Kennett interview Ridley Pearson, Barry Eisler documents martial art tips passed on by John Rain and Ruth Jordan has lunch with Dennis Lehane. Issue 10 provides Lori Lake’s article on lesbian detective novel, Jan Burke’s profile by Ruth Jordan, Julia Spencer-Fleming interviews Jeffrey Cohen and Charles and Caroline Todd are interviewed by Judy Clemens. Additionally, Jason Starr discusses his favorite move, Ayo Onatade is back and talking about books being everywhere and Simon Wood talks about his day job. Six short stories are included this time around. The contributors are A.A. Kelly, Manuel Ramos, James P. Hanley, Julie Hyzy, Judith Cobb Daily and Reed Farrel Coleman. And let’s not forget about Jeremy Lynch’s Eye on Hollywood, DVD reviews and plenty of book reviews…you are bound to find something you enjoy in these 2 issues. 6. Footprints: Lawrence Treat by Ted Hertel Jr.